In many people's mind, ballet is just an extracurricular activity which is fun and beautiful. But in fact, ballet dancers, male and female, have to be very strong physically and mentally. They start their day usually at around 10:00 a.m. in the morning for a warm up class, which is essential in keeping their technique and in preventing injuries. They start rehearsing after the class until late afternoon, possibly followed by a performance which finishes late at night. Always paying attention to what they eat for nice body lines, they have on the contrary very little time for lunch and dinner. A performance usually finishes late at night, rarely before 10:00 p.m. It also takes time afterwards to remove the makeup, the costume, to pack up all their stuffs..... which makes them arrive home very late and exhausted. Nevertheless, they restart another long day next morning. People always consider dancing as a sport because of its high demand of physical fitness. However, ballet is completely different from any kind of sport as dancers are always reaching for perfection, for the quality and not the quantity. When I was small, I asked myself why ballet wasn't in the Olympic Games. Now I understand that ballet is purely a form of art and we can never say objectively that a dancer is better than another. Dancers work everyday for improving their technique as well as discovering their artistry. It's a life-long work for themselves. Like any other form of art, painting, music......etc, they reach for the perfection which doesn't exist. The evolution and the development of ballet has a very close relationship with the opera (in classical music), as ballet is, by definition, a form of opera except that the singers are replaced by dancers. When I watch big ballet competitions on Youtube like the YAGP in New York and the Prix de Lausanne, I always think that these competitions should not have existed, just as there aren't any opera singers in singing competitions. In my opinion, these competitions change the objective of ballet dancing: instead of reaching for the perfection and the quality, the contestants reach for technique and quantity, and thus the spirit of dancing is faded out. Nevertheless, this competitiveness obliges the dancers to push themselves to work hard. Imagine a ballet world without jealousy...... the dancers would not give as much as they can in ballet performances!! 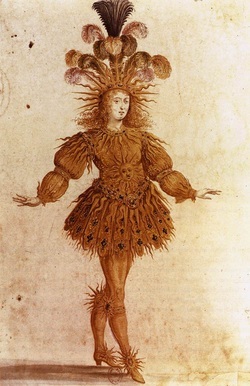 Louis XIV in a ballet costume. Ballet is fascinating not only because of its grace, beauty and expressivity, but also because of its history from the Italian Renaissance. It was a form of court entertainment at that time. When I was small, I loved TV series which are filmed in castles or beautiful palaces. Maybe that's why I love ballet's gestures which were "born" in royal castles. This form of entertainment was widely appreciated and developed in France during the period of the king Louis XIV. He founded the first school of dance on 11th January, 1671, which becomes today the Paris Opera Ballet School. With over 300 years of history, there are numerous ballets of different styles. From the famous "ballets blancs" (white ballet) like Swan Lake and La Sylphide to contemporary dance like William Forsythe's ballets, this rich repertoire offers to ballet lovers a large variety of choices. "Isn't it wonderful that our art could raise that much enthusiasm among that many populations of different nationalities, who could not even communicate to each other through speech? Uniting the young and the old, the poor and the rich, in this supreme sphere with a same concept of beauty? The ballerina that I am, is proud to contribute to this fellowship which lifts up humanity by love and by art. Her profession is a beautiful one."